Kwikonveyors Sprockets are all accurately made with quality materials. The tooth profiles are machined, and conform to international standards. Conveyor Sprockets of all sizes and pitches and also Transmission Roller Chain Sprockets of all sizes and pitches are manufactured. The machined surfaces are smooth and provide full contact with chain rollers, thus assuring maximum sprocket life. 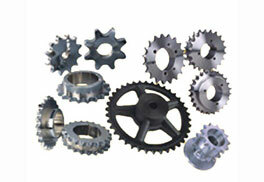 Special purpose sprockets can also be supplied. Finished bore keyway and induction hardening are also offered on specific requirement basis.